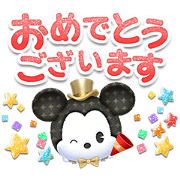 LINE: Disney Tsum Tsum animated stickers are available for a limited time only! Get them for free in time to celebrate our 5th anniversary. Check out the in-game info for more details on how to get this exclusive sticker set.